Goose Creek residents are in crisis this morning after Tropical Storm Hermine caused city-wide power outages that allowed their Mountain Dew supplies to become warm. Refrigerators and ice-makers were out of commission long enough to bring the highly-coveted beverage to room temperature, resulting in mass panic and looting. 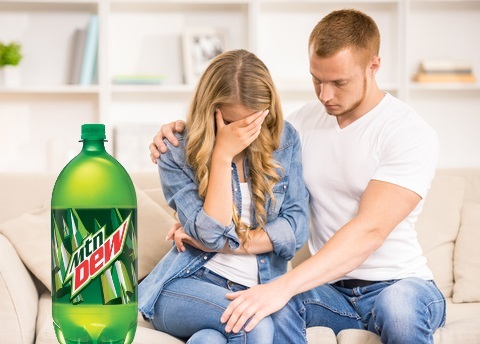 The crisis was only worsened by widespread rumors saying that once Mountain Dew has been cooled and becomes warm again, it’s permanently spoiled and toxic. There were also reports that ingesting above-temperature Mountain Dew could result in someone becoming pregnant with a Chupacabra baby. Panic ensued and residents took to the streets to loot the local Walmart and all surrounding convenience stores, battling for the last remaining cases of fresh Mountain Dew. 4 Comments on "Goose Creek Families Devastated After Power Outages Cause Warm Mountain Dew"
Thanks for the heads up! Any idea what the gestation period is for Chupacabra babies? Moonshine and Mountain Dew is what baby chupacabras thrive on…one part to one from a baby bottle. Protect your goats from the Chupacabra bloodsuckers! Wow. Just drink water, folks. and buy MGT stock to protect ourselves from cyber threats.